Vitamin E Market size was over USD 2 billion in 2015, increasing with estimated gains at over 3.5%. Increasing healthcare costs have resulted in a shift in the consumer demand for dietary supplements to keep themselves healthy. Strengthening of the immune system, reduction of migraine headaches, protection from flu and cold, and controlling blood pressure levels and cardiovascular diseases are the major benefits offered by these supplements. As geriatric population ratio is increasing in Europe, U.S., and Japan, more people are looking for medications to cure and taking precautionary supplements to help them stay healthy well. Health is not just a goal, but a lifestyle choice to stay fit in these regions. U.S. food and dietary market is witnessing significant gains owing to shift in consumer preference towards healthy diet. As of 2015, consumers 65 and older accounted for over 35% of U.S. vitamin and health supplement sales and is expected to continue over the forecast period. Animal feed additives market expansion due to rise in livestock production for meat consumption should drive industry growth. It has been the one of the key micronutrient used in the livestock feed industry. Improving immune function, health, reproduction and product quality, in ruminants are major factors fueling product demand. Rising consumer preference for products containing healthy and natural ingredients should facilitate global vitamin E market size growth. Growing consumer consciousness pertaining to toxic chemical additives used in the personal care and food & beverages products applications should enhance vitamin E demand. Distribution network expansion and easy vitamin E-based dietary supplements availability of in the form energy drinks, tablets, and, capsules, have has driven product demand. Regardless of vitamins being a generally troublesome class for shoppers to search for online without earlier item information, online deals have encountered a sensational increment during the most recent five years. The essential driver of this has been retailers engaged endeavors on enhancing the web based shopping background through better online training and focused on promoting. This has expanded the solace level customers have for purchasing vitamin product on the web. Vitamin E market share is undergoing a major imbalance in supply and demand as the natural vitamin E price trends have witnessed a significant increase. Raw material shortage along with deodorized distillates are primary reasons impacting vitamin E market price trend. Increasing livestock demand is resulting into rising animal feed additives. Synthetic vitamin E market size was worth over USD 1 billion in 2015, the product is majorly used ingredient in global animal feed industry. The product demand in animal feed applications will continue to grow owing to rising livestock production in China, Brazil, Russia and India. These countries are increasingly adopting advanced animal production system to meet rising domestic demand. Tocopherols is foreseen to generate more than USD 300 million by 2024. Rising disposable incomes are enabling consumers to spend more on dietary supplements for maintaining healthy lifestyles. U.S. and Europe are the largest contributors to the global consumption; the Asia Pacific market is rising at a significant pace and is expected to witness fastest growth. Global animal nutrition market was valued at over USD 1 billion in 2015. Rising domestic meat demand in Asia Pacific, coupled with the region’s development as a major meat exporter has increased animal nutrition demand. Increasing per capita income of India and China coupled with the improving lifestyle has led to high demand for superior quality meat. In addition, an increasing awareness about livestock diseases has led to the adoption of better animal nutrition practices, which are also expected to play a major role in driving vitamin E based animal nutrition demand. Dietary supplements vitamin e demand is forecast to grow at over 4%. Tendency in consumers for taking supplements and consume dairy products mostly across the western countries played a significant role in the product development over the past few years. Cosmetic application expects the highest growth increasing at over 7% CAGR. Changing lifestyles and rising consumer affordability have driven the cosmetic market growth. People are becoming more conscious about their skin as being presentable and maintaining a healthy lifestyle are becoming essential aspects of living. Moreover, an increasing women worker have also resulted in the cosmetic product demand. Vitamin E cosmetics helps in reducing inflammation within the body and on the skin, which eventually helps in maintaining healthy and youthful skin. 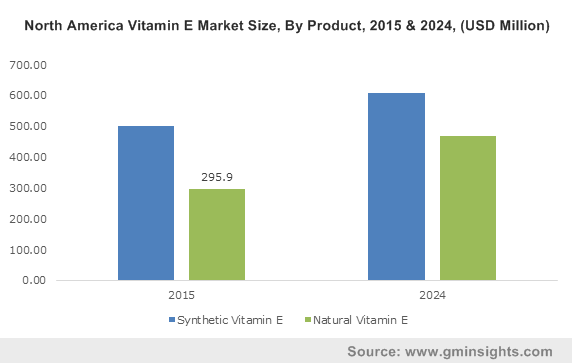 Rising consumer consciousness towards health and wellness along with healthcare legislations are driving U.S. vitamin E market size growth. The regional human nutrition generated over USD 100 million in 2015. Increase in geriatric population is resulting in more dietary supplements demand. The people are prepared to spend on nutritional products in their regular food materials owing to high disposable income and improved economic conditions. Europe animal feed market has observed favorable market trends, including growing high protein diets demand, in Russia and Germany where per capita income is also rising rapidly. Germany vitamin E functional food market size was over USD 10 million in 2015. Increasing health professionals are working to implementing approaches to practice and recommend health supplements to their patients for overall health and wellness. China vitamin E animal nutrition market was over USD 70 million in 2015. In 2014, Asia Pacific dominated the overall meat production and was estimated at over 130 million tons. China accounted for over half of the total pig meat production in 2014 and was a major exporter for the same. Vitamin E market share is consolidated in nature as top five industry players accounting for over 50% of the global demand in 2015. Currently, the market is more competitive and open with producers in India and China having taken a large share of the market. DSM has been a leader in vitamin E development and manufacturing for over 70 years. ADM, Cargill, BASF, COFCO Tech Bioengineering, and American River Nutrition are the leading companies in terms of revenue and geographical presence. The industry manufacturers are consistently scrutinizing alternative production means which can eradicate supply and demand imbalance. While a couple organizations are expecting to sidestep the issue of supply, yet others are investigating substitute sources, for example, deodorized distillates from palm oils, rapeseed, and blended sources to concentrate characteristic vitamin E.
Nutraceutical ingredients are characterized as a piece of food or an entire nourishment that have a therapeutic or medical advantage, including the avoidance and treatment of different chronic diseases, for example, cancer, obesity, hypertension, and diabetes. With expanding educational levels, individuals are gaining awareness in regards to the sorts of foods and drinks that helps in keeping up a balanced eating regimen and legitimate wellbeing. Producers are also taking in thought the accommodation consider for customers and providing them with healthy nutrients as nourishment and refreshments rather than supplements. Cosmeceuticals is another emerging idea, which joins nutraceutical with individual care. Nutraceutical elements have application in the personal care industry through cosmeceuticals. For example, lot of vitamin and mineral enriched hair products are launched in market which ensure better skincare and hair care. Animal nutrition is creating, with the developing interest for milk and meat. To attain more output, animal product manufacturers make use of various nutritious ingredients in animal feed.